Like most Americans, soda was a key staple in my family. I’ve guzzled down so many cans of root beer in my life than I want to admit. Surprisingly, the one type of soda I was never able to stand was diet. Diet soda has always tasted wrong to me, and I marvel at how my parents have still consumed the beverage for decades. Come time to fifth grade, and I had to go through the mandatory D.A.R.E program in my school. There we learned about the dangers of alcohol and cigarettes, as well as recreational drugs and addictions. There it hit me. I would always notice how much my mother’s mood would fluctuate during a given day, and her tendencies to reach for a pop when she was feeling tired or down in her mood. I correlated it with addiction, and proceeded to ask my D.A.R.E. officer if it was possible to become addicted to soda. Later that day, I held my first ever intervention with my mom – at the age of 11. Needless to say, my intervention was completely unsuccessful. My mother and father still continue to laugh it off whenever I nag them to give up diet soda – even when I tell them about how much damage they’re doing to their bodies by drinking it. Now I know what you may be thinking, this is old news. 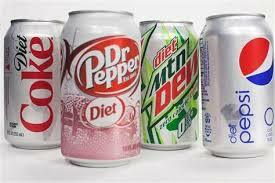 Everyone has heard this information and knows how bad soda, especially diet soda, can be on your body. Why am I even bothering? Well, have you seen a removal of aspartame or sucralose from beverage products? Have you seen a change in advertisements for these products? Have you seen a decrease in its consumption? Gotta love that carbonated, artificial goodness. I am afraid that the more we tend to push this issue aside, the larger its effects will become and the more it will haunt our country as time goes on. So here’s a brief synopsis about on the most common artificial sweetener on the market: aspartame. Aspartame was originally discovered by a scientist at the G. D. Searle Company, trying to create a new anti-ulcer drug. It was later approved for usage in dry foods in 1974, and eventually made its way to approval in all food and beverages. It is comprised of 3 parts: Aspartic Acid, Phenylalanine, and Methanol. Aspartic acid, which makes up 40% of aspartame, is an amino acid found commonly in our bodies. It also functions as a neurotransmitter. The problem comes when it allows too much info between cells. It can kill them by letting in too much calcium. However, this is only serious in high amounts. The second component to aspartame is phenylalanine, which comprises 50% of aspartame. This is also another amino acid, but only one that we can obtain through our diet. It doesn’t really cause any trouble unless you suffer from phenylketonuria, which is a condition that prevents phenylalanine from being metabolized in the body. Too much buildup of phenylalanine can damage the brain. The remaining 10% of aspartame belongs to methanol. Also known as wood alcohol, it can be found also in antifreeze. When processed within our bodies, it transforms into formaldehyde. We all know that formaldehyde is used to preserve the deceased. Companies advertise these drinks as our solution to our problems. Or the best way to have a good time. The Pepsi commercial, though from the 80s, shows another prime marketing spin: drink this and you’ll lose weight and be happy! In reality, though diet drinks don’t contain any calories, they are hundreds of times sweeter than normal sugar, and they leave our bodies craving starches and carbohydrates. This causes us to compensate, and actually gain more weight than lose. So, what can we really do about this? Well, obviously diet drinks that contain aspartame should be reconsidered for consumption. Try to find an alternative that is less harmful on the body and consume artificial sweeteners, like everything else, in moderation or try to avoid them all together. I’m not saying white, refined sugar is better, but it’s better than ingesting chemicals that produce such negative side effects. The Mayo Clinic has a article that can give you more options for your diet. Like I mentioned earlier, my parents still drink diet soda and no matter how much I warn them, and they aren’t willing to change. In order to change how our drinks are manufactured, we need to change our own purchases. We have more buying power than we tend to realize – let’s put it to use. If you want to understand the history and context of artificial sweeteners better, I would recommend the book Empty Pleasures by Carolyn de la Peña. It’s an accessible but in-depth cultural history that doesn’t talk specifically about the nutritional issues but does go into how and why we started using them instead of sugar. Mm. Duly noted. Thank you!